Boston Dynamics, a robotics company acquired by Google in 2013, last made the news in 2008 with its “BigDog” robot – a quadrupedal, dog-like robot with a remarkable sense of balance and stability. Now, the company has developed “Spot,” a smaller, lighter version of BigDog – and a few frames of video have the internet frothing mad. Both BigDog and Spot work on similar principles: Four independent, hydraulically actuated legs that give the machines the dexterity of a dog or horse. Sensors embedded within the body give them a remarkable degree of capabilities – they can run, trot, and climb; march in formation and identify their “owners.” The sensors also give the robots corrective balancing abilities, the demonstration of which struck a nerve with many. In Spot’s release video, the robot is shown running and climbing, and even “going for a walk” with its larger cousin. 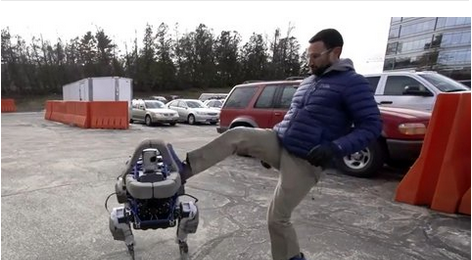 To demonstrate Spot’s balance, a Boston Dynamics employee gives the machine a stern push-kick; the robot falters but quickly regains its balance. Plenty of internet pundits found the kick unethical, likening it to kicking an actual, living dog. The Daily Mail cites experts that say a robot will never, ever be able to experience pain or human emotions due to the complexity involved in such concepts: While we may be able to understand them from an end-user standpoint, even humans aren’t capable of unpacking them and translating them into binary code. Others offer that while it may not technically be unethical to kick an unfeeling robot dog, kicking something is generally not a nice thing to do.